Posted January 10, 2017 by Guest Blogger and filed under the category Apologetics. Unreasonable faith—believing in something in spite of the evidence. Blind faith—believing in something without any evidence. Reasonable faith—believing in something because of the evidence. I want to show evidence that makes it reasonable to believe in the Bible. The bibliographical test: determining whether the text of the historical record has been transmitted accurately. Josh McDowell states, “No other work in all literature has been so carefully and accurately copied as the Old Testament.” He can make this claim because the profession of “scribe” was one of the most professional and exacting of all professions. The rigorous standards employed to prove the accuracy of a copy of a biblical manuscript was higher than for any other literature. 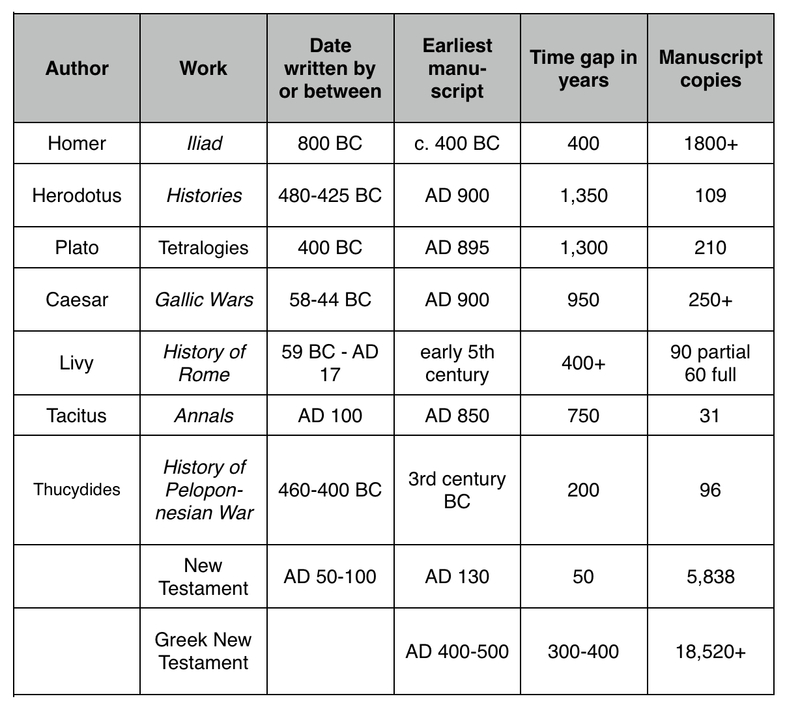 Then regarding the New Testament, Josh McDowell says, “I believe there is more evidence for the reliability of the New Testament than for any other ten pieces of classical literature put together.” Check out this chart reproduced from McDowell’s book God-Breathed to see by comparison to other literature, how close in dating the earliest biblical manuscripts are, and how many of those manuscripts have been discovered! 2. 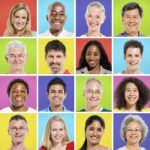 The external evidence test: determining whether the historical record has been verified or affirmed by data outside of itself. 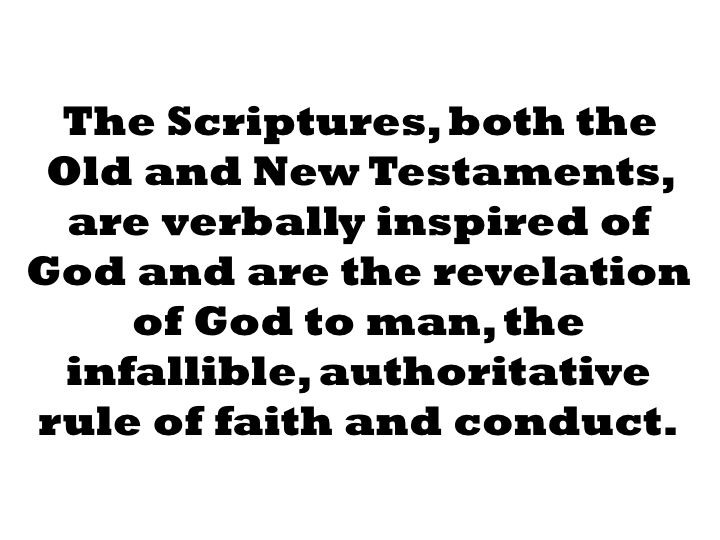 Over one-fourth of the Bible is prophetic, and two-thirds of its prophesies have already been fulfilled. For example, 700 years before His birth, the city in which Jesus was to be born was identified by a man named Micah. 3. The internal evidence test: determining how of the historical record stands up to the test of internal validity. The Bible was written by 45 different authors, over a span of 1500 years, on 3 different continents, and in 3 different languages. Yet there are no contradictions! Changed lives. My life is one that has been amazingly impacted by the God of the Bible, as was a man named Saul, who had a total about-face after encountering Jesus. As a result, Christianity was spread far and fast through his writings and world travels. “Before Christianity, there were cults that practiced all sorts of human sacrifice as well as self-mutilation and self-castration. Before Christianity, the weak were despised, the poor maligned, the handicapped abandoned. Before Christianity, infanticide was rampant, slavery run-of-the-mill, and gladiatorial combat a form of entertainment. In Jesus’ day, Corinth was famous for its temple prostitutes, continuing a long-standing tradition symbolized by the Corinthian athlete Xenophon.… Aristotle…not only condoned institutionalized slavery but provided an elaborate argument in favor of it. As if that weren’t enough, Aristotle called man ‘begotten’ and woman ‘misbegotten,’ and because a woman’s reasoning was ‘without authority’ accepted no female students. Is all of this “proof positive” that the Bible is God’s Word? No, it’s not. But I think the evidence is compelling enough that it is certainly reasonable to reach this conclusion. Other than because it says so in the Bible, how do I know that it is God’s Word? How can I let the Bible “thoroughly equip” me (2 Timothy 3:14-17)? Is my worldview pragmatic or biblical? Does it really make a difference? In God-Breathed—the Undeniable Power and Reliability of Scripture, Josh chronicles his recent identification of ancient fragments and a 540-year-old Torah, along with his personal journey to faith as an unbelieving skeptic of Christianity and the Bible, to present a compelling case that God’s Word can be trusted to be undeniably reliable. “My hope is that this God-Breathed book will help people realize not only that the word of God is true, but also that it is alive and powerful. I equally want people to be convinced they can trust the Bible because the evidence is so incredible,” Josh said. « With Endless Information, Can We Know Anything At All?